Visiting North East England? What to see and do, where to eat and drink, events and special offers on our bed and breakfast accommodation blog. If you are staying at our bed and breakfast accommodation this spring you may like to visit the Leonardo da Vinci – A Life In Drawing exhibition that is taking place at Sunderland Museum & Winter Gardens. 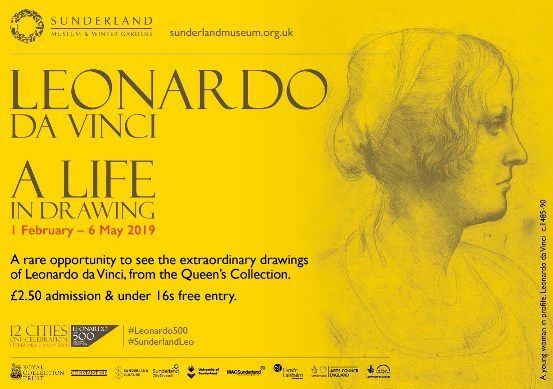 Sunderland Museum & Winter Gardens‘s Leonardo da Vinci – A Life In Drawing exhibition starts tomorrow, Friday 1st February until Monday 6th May 2019 at Burdon Road, Sunderland, SR1 1PP. Sunderland Museum & Winter Gardens is easy to reach from our guest house – either by car or the #20 bus from the bottom of our street direct to Park Lane Interchange in Sunderland. More ideas of places to visit while staying with us can be found here: Places To Visit. Book direct on our website and receive breakfast free of charge. Use special offer discount code april2019 when making your reservation. Valid for all reservations made before 23:59 on 30th April 2019 that use special offer discount code april2019. Valid for all room types, room rates and future dates of stay.